Wireless earbuds in charging case. 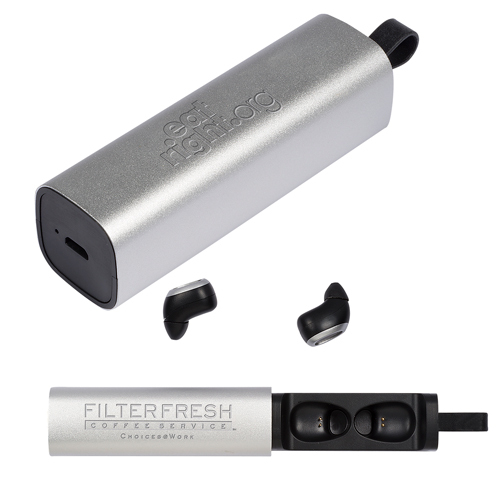 Earbud Battery (built-into each bud): Rechargeable Lithium Polymer Battery, Capacity - 40 mAh/3.7V, Input 5V/60 mA. Case Battery Rechargeable Lithium Polymer Battery, Capacity: 200 mAh/3.7V, Input 5V/200 mA; Frequency response: 20Hz -20KHz; Transmit Range: 10m (30 ft); Bluetooth® V4.2. Item must be charged prior to first use. Charge time varies by device, minimum charge time 2 hours. Case made of Aluminum and ABS Plastic. Gift Box / 27 lbs lbs / 100 pcs pcs. / 10 x 17 x 14box.